Here's the perfect white cotton creeper for your baby's christening, baptism, or dedication! This sweet little white knit bodysuit is made by Squiggles by Charlie, a leading designer of Peruvian pima cotton knitwear. 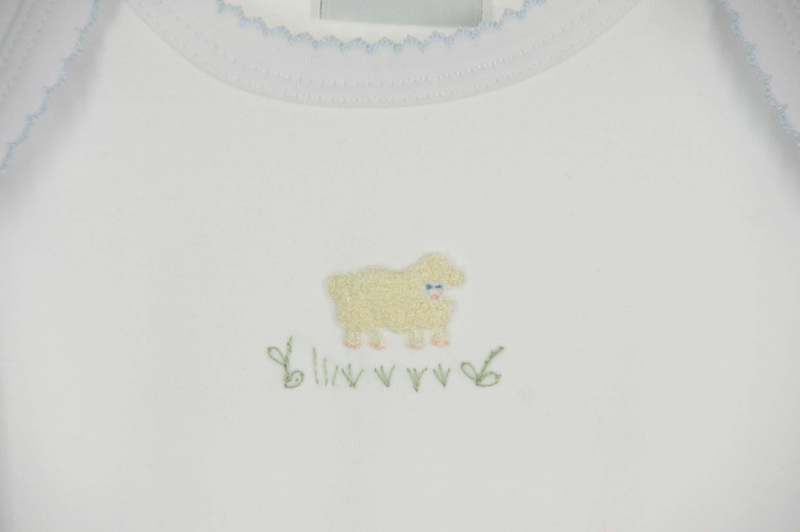 Made of softest pima cotton knit, has an ivory lamb embroidered on the chest. It is ideal to wear under any christening outfit, baptism gown, or any special occasion clothing to keep baby cozy and comfortable and to keep the pattern on disposable diapers from showing. In hard to find 100% cotton, it has blue picot edging at the neck and lap sleeve shoulders. Perfect for your baby boys take home or Easter, too! Note: This sweet bodysuit is also available with pink trim. See below.